The ‘Young Mr G’ gave a superb 20-minute show to birdwatchers and the general public off Porthmadog Cob again this afternoon. He has been seen often at this site in the last fortnight. Several times he flew up and down the Glaslyn river looking for a fish to take back to the female on the nest three miles away. At one time he even hovered above the Llyn Bach mudflat searching for prey. 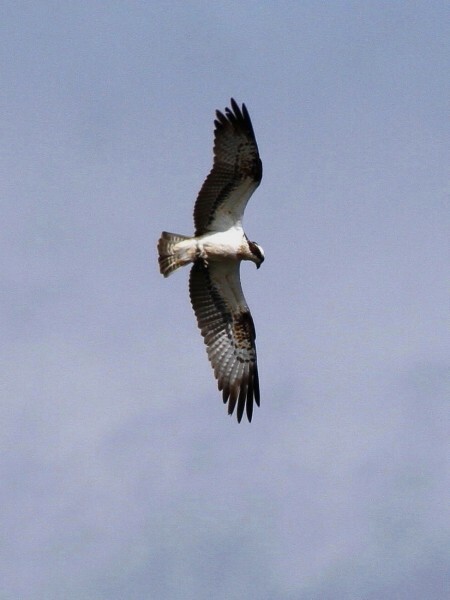 It is an awesome experience watching Ospreys fishing. They are continuously scanning the waters – often from a height of a hundred feet or more – whilst using their amazing eyesight to find unsuspecting fish. Sometimes they have to re-adjust their position in gusty conditions or stoop lower to get a better view before homing in on their prey. On occasions, they abort their dives at the last minute. They are true masters of the air. Unfortunately, the Osprey was having a tough time of it this afternoon. Not once did he dive into the water. Perhaps there are few fish at present moving upriver in the unseasonal cold weather we’re experiencing. He had also attracted the attention of the local gulls which eventually forced him to redeploy to the Dwyryd estuary a mile away the other side of the embankment and out of sight of the grateful observers.